The road to Kaliki with the active volcanoes of Batur and Agung in the background. Indonesia has long been a travel destination for my family and many of our friends – and, in particular the beautiful and exotic island of Bali. We went there for the first time in the 80’s and found ourselves in the hills of Ubud staying in the guesthouse of a Balinese prince that overlooked a lush and colourful tropical garden, rice fields, and rushing river where the locals (and us) went to bathe. We were forever seduced. I remember that this holy place was surrounded by the beautiful white ginger (Hedychium coronarium) enveloping the bathers in it’s heady, spicy fragrance. I also remember the sign pointing to it for visiting westeners to find their way down to its cool, refreshing waters saying simply ‘Holly Sprig’ (holy spring – lost in translation?). 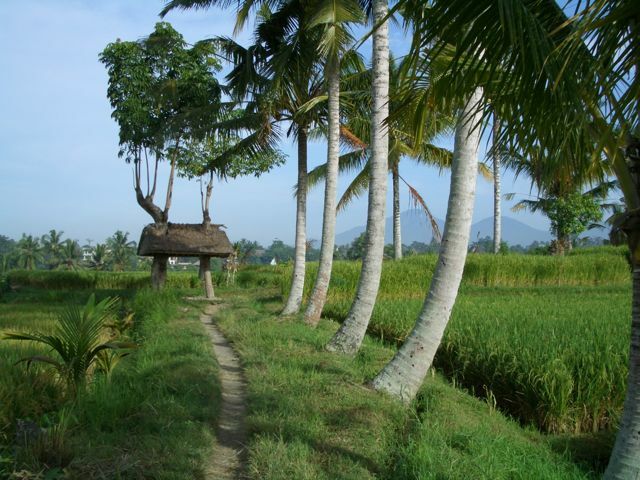 On that first trip we walked along this track, in the top photo, through the rice fields on our way to the holy mountain of Besakih; we went to a ceremony at the Palace with our Prince, where the royal children performed frog dances and gamelan music on bamboo flutes and xylophones – and we ate a Balinese feast. 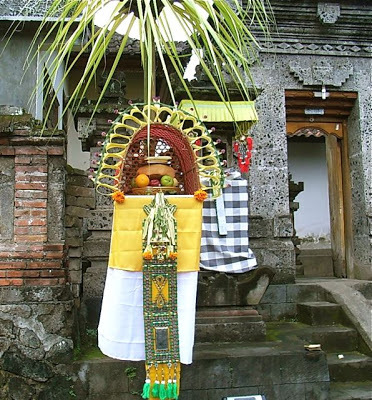 Every day we came across roads clogged with gorgeously dressed men and women, carrying enormous head-dresses of lovingly made offerings of fruit and sweetmeats, on their way to temple ceremonies, for it was the festive season of Galungan. Making satay is traditionally the work of men and eaten at ceremonies, as well as just everyday street food. 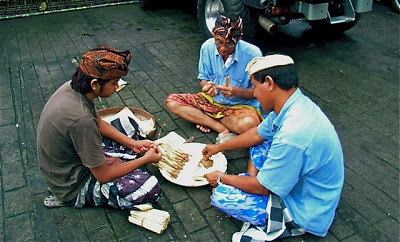 I bumped into these chaps – in their ceremonial sarongs and headscarves, just sitting in the middle of the parking lot making satay for the impending cremation ceremony of our Balinese prince’s mother. We saw every kind of artisan and artist at working their craft and displaying their wears – basket makers, textile weavers and batik artists, wood carvers, stonemasons, painters, leatherworkers and the incredible everyday skills that everyone possesses for the making of ceremonial offerings (the Balinese are Hindu) And we ate, and ate, and ate. Our first trip changed us forever. I worked out that I have visited Indonesia about twenty times since then, both for holidays and wonderful working assignments, both our daughters ended up studying at UGM University in Jogyakarta for a year and being fluent in the language, and our travels further afield in Indonesia have taken us to the shores of Lake Meninjau in Sumatra, snorkelling on the Bunaken Islands of northern Sulawesi, climbing to the top of Borobudur in Java to salute the sun, stalking the prehistoric Komodo Dragons on the islands off Flores and travelling up the Mahakem River in Borneo to the Dyak villages. How lucky am I? How fortunate that I went to Bali before there were any luxury hotels and the movie ‘Eat, Pray, Love’ and before it got loved to death. Indonesian cuisine is not as well known as other Asian food, but it deserves to up there with the best of them. 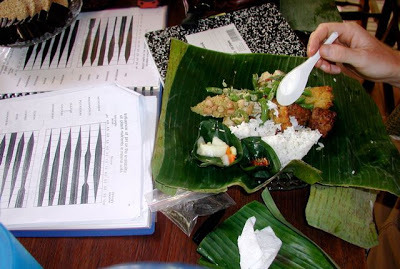 I’ll give you a quote from one of the top writers about Balinese food – resident Janet de Neefe (ex Melbourne) The Food of my Island Home and Rice. Janet, and her Balinese husband Ketut, own and run a restaurant (Indus), cafe (Casa Luna) and guest house (Honeymoon) all in Ubud. 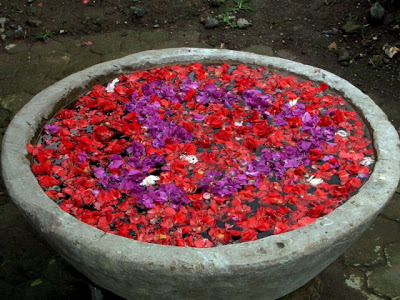 Janet was also instrumental in setting up the very successful Ubud Writer’s Festival – her next venture is a cooking tour of the Spice Islands off Flores. If I want to know anything about Indonesian cuisine, I go to her. “On the table in front of me lies my favourite meal: nasi campur, a serve of freshly steamed rice with small helpings of delicious things. There is braised tempeh, gently spiced fish, wok-fried water spinach with a scattering of fried chillies, amber-tinged chicken, warm sprouts and green amaranth tossed in peanut sauce, plus fried sambal – which I simply can’t live without. Just a spoonful of each alongside the rice is enough to satisfy the stomach and enliven the tastebuds. 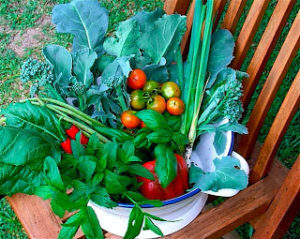 In 2004 I found myself teaching the principals or organic gardening to the Balinese – mostly those employed in the gardens of large hotels who were trying to grow some of the food they put on the menu from their own kitchen gardens (Alila Hotel, Ubud, and Alila Mangis, Candi Desa) – I also helped design those gardens and outdoor kitchens for cooking schools.. We fed our students nasi campur for lunch – delicious spicy seasonal tidbits with rice, wrapped in a banana leaf – with any waste going straight into the compost bin. I learned far more on these courses than I ever taught the Indonesians. Most nasi campur will contain satay of some kind and this is a really simple adapted recipe that you can make with any kind of minced meat or fish. 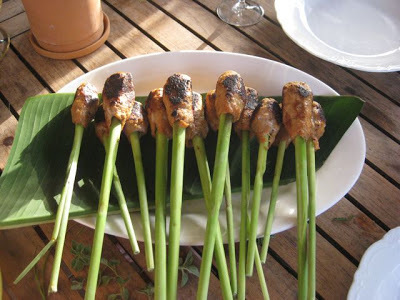 I usually make this when I have dug up a clump of lemon grass and have lots of the best satay sticks you could possibly find (you can also use chopsticks that have been soaked in cold water for a couple of hours to stop them burning). Lemon grass is fantastic for this job because it doesn’t burn and also imparts a subtle flavour to the satay. You may be familiar with the pieces of meat. charcoal grilled on bamboo skewers, served with peanut sauce on most street markets in Asia – and a particular favourite of Malay cuisine. 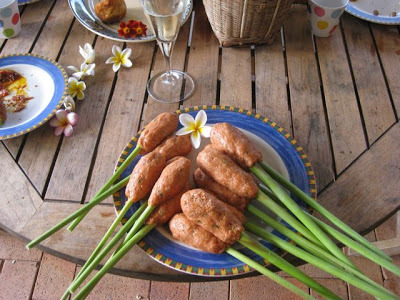 Well, this recipe is a little different to the Malaysian version and is a Balinese speciality that’s really easy to make and particularly tasty, it’s made from minced meat or fish rather than pieces – kiddies love them! 2 tbs desiccated coconut that has been soaked in water for an hour and then squeezed out. 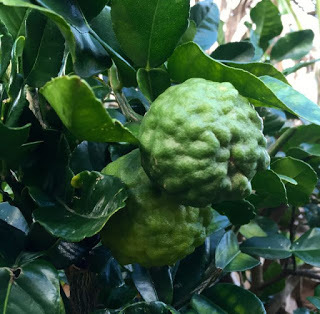 NOTE: If you can grow a makrut lime (old name kaffir) you can substitute the zest of the fruit for the shredded leaves. Blend the spice paste together in mortar and pestle or food processor and add to chicken mince. Mix together evenly and mould over ‘sticks’.